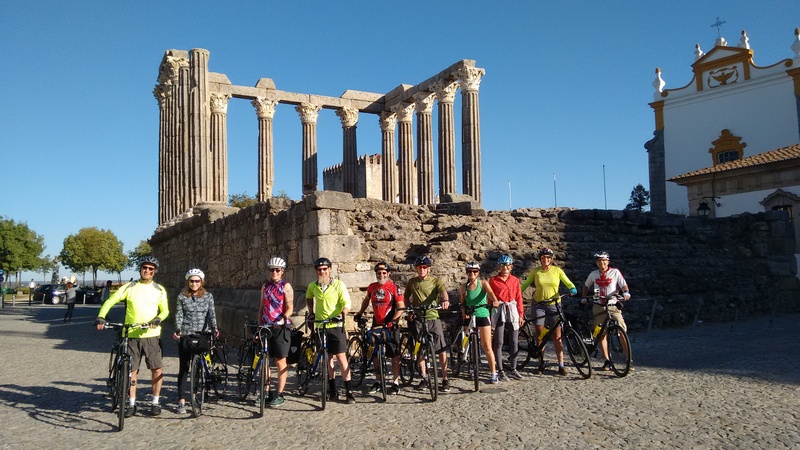 A favourite day ride circuit through some gorgeous, unspoilt countryside close to the border with Spain – with three ruined castles to see along the way. 78km / 49m. Moderate. Several good climbs but nothing severe. Around 1,000m of ascent over the ride – maximum grade (incline) 8.3%. The nearest big town to Trancoso is Guarda (40km south) where you can find a good range of accommodation, supermarkets etc., plus train and other transport connections. 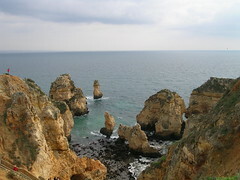 Accommodation – There are various pensions and small hotels in Trancoso, Marialva and Penedono. The Dom Dinis in Trancoso (near the post office on the N226) is a decent cheapie. There’s also a truly excellent new municipal campsite at Mêda. Shops & supermarkets – Small shops in Trancoso and Penedono, plus a modern Intermarché supermarket at Mêda. Cafes & Restaurants – Cafes in Trancoso, Meda and Penedono, several restaurants in Trancoso. 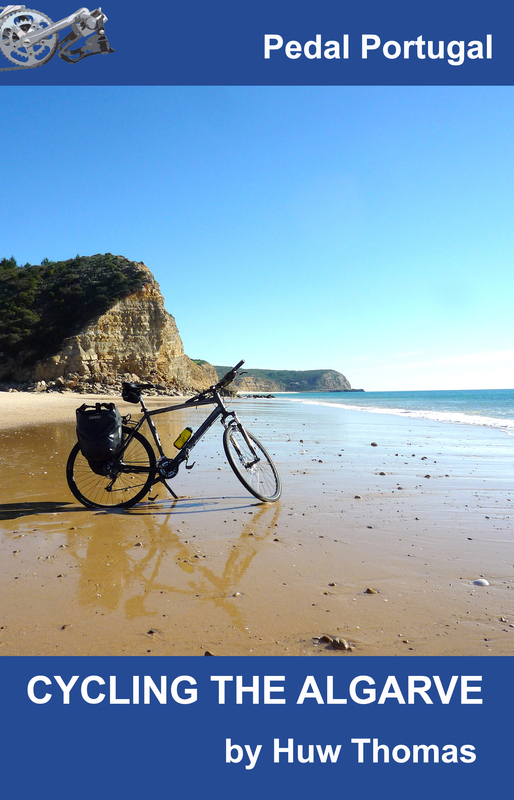 To begin: This was one of our favourite rides we did in Portugal. Trancoso is a beautiful small town with a walled centre. It’s well worth a visit just to walk around the tops of the walls, see the old centre and admire the views from the ruined castle (closed for restoration at last visit). Heading north: Set off from the town square and head SE on Rua Cavaleiros. Outside the walls turn north on Avenida Eng. Frederico Ulrich. This will take you a sweeping downhill run to join the N102 heading north towards the Duoro Valley. When we originally rode this route in 2009, the N102 was the main road north but still very quiet.Since then, a major new, motorway-standard dual carriageway (the IP2) has been built more or less parallel. Although the views in this section are no longer quiet as pretty, the IP2 is still pretty empty and the N102 gets even less traffic than before! To Marialva: The N102 will take you to the turn off for Marialva. 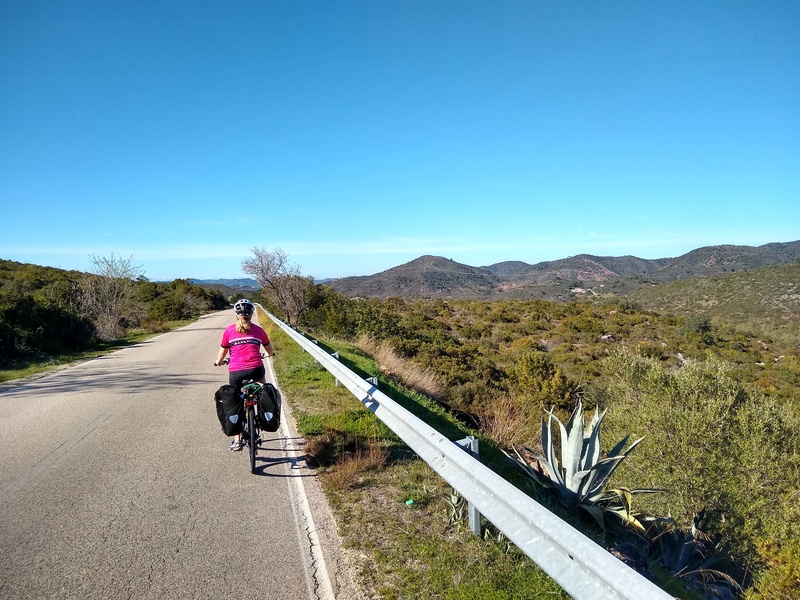 The terrain is quite gentle and there’s little along the way to detain you except for the views of almond blossom in the spring, rolling fields, and hills covered with granite crags and boulders. Marialva to Penedono: The castle at Marialva (and surrounding village) are worth stopping for – although try to check opening times for the castle. There’s also an upmarket hotel here – Casa das Coros – that gets good write-ups on Trip Advisor. From the Marialva junction, follow the EN331. There’s a good climb up to Meda, where there are a couple of small shops and cafes – plus some benches in a small garden if you need a break. There’s not much to the town centre, although it’s pleasant enough and their are some dramatic views from the chapel on the craggy peak above town. As you head out of town towards Penedono you will also pass a large, new Intermarché store. 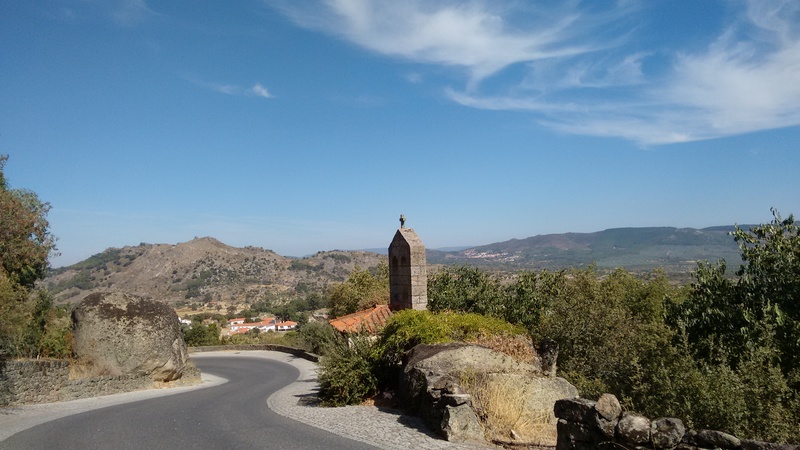 From Meda, there’s a long downhill to the river – and then an equally good climb up to Penedono. This is all quite wild country – some farmland but also lots of scrub and empty hillsides. Beautiful and quite remote with few houses and very little traffic. Penedono and south: Penedono is another pretty, historic small town with a fine castle that’s well worth the visit and lots of other old houses and buildings. Keep towards the top of town and head out past the fire station (Bombeiros) on the EN229. This road climbs, reasonably gently, up towards a ridge from which you’ll have fantastic views in all directions. 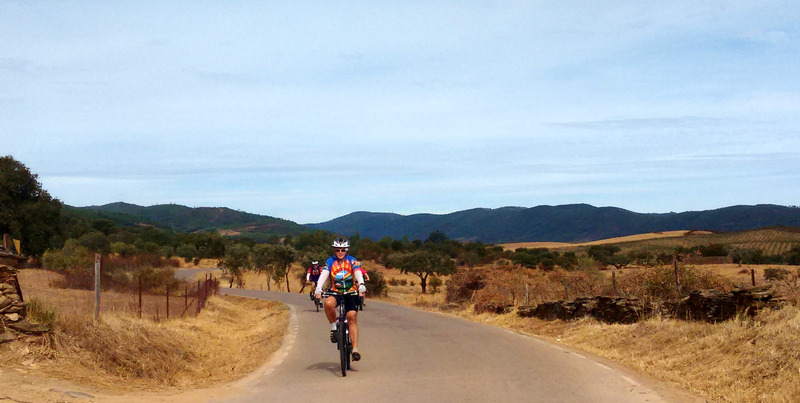 Follow the road south through Antas and on. You’ll drop down into a wild, empty-looking valley – lots of cistus scrub and granite boulders but no sign of civilisation. Keep going and start to climb gently back up and you’ll eventually join the N226 – turn left for the last stretch back up into Trancoso. Riders: Huw & Carolyn Thomas, 2009 & 2010.